We hopped on the water taxi at Rialto and got off at the train station and boarded a train to Florence this morning. So I’ve got some time to put down my thoughts on Venice. It is an amazing city. I couldn’t stop thinking about how they built the city. How did they get all those foundations built underwater? And when you ride up and down the Grand Canal, you can’t help but think of the life the merchants of Venice lived in the glory years. Everywhere you can see the signs of the influences from India and the east. It’s such a cool city. But it’s also pretty much a dead city. At least in the winter. There’s nobody there. We’d often walk back through the city streets after dinner and barely pass anyone. I suppose that’s a lot better than what happens in the peak tourist time in mid summer. But it makes you realize that Venice is mostly a tourist destination today. Not much else happens there. Cruising around town on the water bus, Venice’s version of the subway. I love public transportation and we got a day pass and took the water bus everywhere. You can walk anywhere you want, but the water bus has the views, and they are spectacular. Dinner last night at Al Gondolieri, across from the Peggy Gughenhiem Collection. 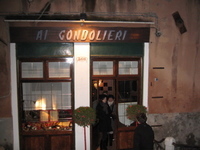 Wonderful vibe, great food, and very friendly. 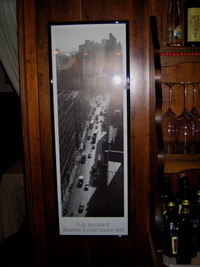 The owner had a photo of Union Square in New York City that could easily have been taken from the roof of our building at 915 Broadway. The Palazzo Grassi Museum and Ca’ Rezzonico, two great Venice homes turned into museums across the Grand Canal from each other. Ca Rezzonico is all about Venice in the 18th Century, both its art and its décor. The Grassi is all about modern art. This basketball hoop by David Hammonds with its chandelier style decoration is hanging in the Grassi right now. It reminds me of the chandeliers we saw being made on Murano Island, the home of Venetian Glass. 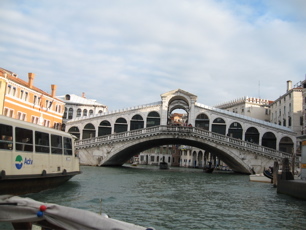 And it sort of sums up the Venice of 2006 for me, wonderfully beautiful and magical but not used in the real world.